kulasEkara AzhwAr is fondly called kulasEkara perumAL. It was his great attachment towards perumAL (srI rAman) and many similarities with srI rAman (being born in kshathriya vamsam, thirunakshathram being punarpUsam, being most righteous, etc) which earned him the name kulasEkara perumAL. 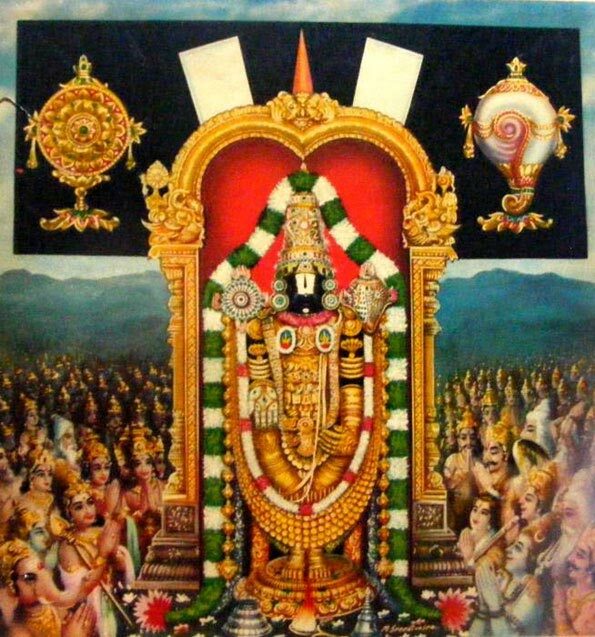 perumAL thirumozhi is one of the greatest expositions of the principle of sharaNAgathi towards bhagavAn. There are 10 padhigams (105 pAsurams) in this dhivya prabhandham. In this article, we will go through the most beautiful and esoteric meanings that are present in abundance in this dhivya prabhandham. Each padhigam is explained briefly using the avathArikai (introduction) of most merciful periyavAchAn piLLai's wonderful vyAkyAnam (commentary) and the phala pAsuram (the last pAsuram which explains the result of reciting/understanding the pAsuram). kulasEkara AzhwAr acquired bhakthi rUpApanna gyAnam (knowledge which has matured in to bhakthi) by the causeless mercy of srIman nArAyaNan (who is fully situated in knowledge and bliss, who is filled with all auspicious qualities, who is the master of both nithya vibhUthi and leelA vibhUthi and who is the antharyAmi (in-dwelling paramAthmA) of everything/everyone). Since AzhwAr was divinely blessed by emperumAn, he develops great attachment towards emperumAn and since the ultimate state of bliss is acquired by enjoying the auspicious qualities of bhagavAn, he desires to enjoy the same in srIrangam as well. Just like nammAzhwAr who desired to enjoy bhagavAn's qualities with his devotees, kulasEkara AzhwAr also desires to enjoy and serve emperumAn along with other devotees of bhagavAn. In this padhigam AzhwAr fully immerses in enjoying the various aspects of emperumAn like his parathvam (supremacy), his sauseelyam (magnanimity), his akila lOka sharaNyathvam (being fully capable of giving shelter to everyone), his krupai (mercy), his ability to remove all hurdles in our endeavours towards him, etc. In the last pAsuram, AzhwAr declares that the ones who learns and masters this padhigam, will be able to blissfully serve the lotus feet of periya perumAL who is full of auspicious qualities. For the ones who surrender to bhagavAn, naturally many auspicious qualities will develop. Doing what is favourable for bhagavAn/bhAgavathas, avoiding what is unfavourable for bhagavAn/bhAgavathas, having strong faith that bhagavAn will protect us, accepting him as our refuge, offering oneself to him and humility are six qualities of the ones who surrender. Of these, in the first 2 padhigams, AzhwAr explains Anukulyasya sankalpam. In the first padhigam, favourable attitude towards bhagavAn is exhibited and in this padhigam favourable attitude towards bhAgavathas is exhibited. Both are required. bhagavAn being avAptha samastha kAma (one who has no unfulfilled desires) cannot be done any favours especially in paramapadham. But when he descends to samsAram and stays in archA vigraham (form), he completely depends on his devotees for his bathing, eating, dressing up and caring. So, it is the utmost responsibility of the devotees to serve bhagavAn's archA form in dhivya dhEsams and other kshEthrams. While bhagavAn being the most supreme, he can protect himself. But on the other hand, bhAgavathas being jIvAthmAs with limited capabilities, must be the object of our service and care - since they are the ones who really need it. And this aspect of bhAgavatha kainkaryam is greatly explained in this padhigam. In the last pAsuram, AzhwAr declares that the ones who fully understand this padhigam, will accomplish bhAgavatha sEshathvam (being subservient to the devotees) which was most desired by him. In this padhigam, prAthikUlyasya varjanam is explained. Previously, the importance of associating with devotees is emphasised by AzhwArs. In this padhigam, AzhwAr shows his detachment towards the ones who are not favourable towards emperumAn. It is natural that samsAris are always going behind wealth, fame, etc - everything centered on their body and mind. To differentiate ourselves from samsAris, we should avoid any association with them and also try to not behave like them. After all if we are to be prapannas, we should try to exhibit some qualities for that. Serving the devotees can only happen if the devotees accept us and our service. But giving up the attachments is completely with us. It is the same sAsthram which shows our engagement with devotees that shows our dis-engagement with others. True realization means mixing with devotees who are situated fully in sathva guNam (mode of goodness). prAthikUlyam (unfavourable attitude) is thinking that we are the body, being attached to materialistic pleasures and not thinking beyond the bodily platform. We have to overcome these to be fully situated as a devotee. Just like srI prahlAdhaAzhwAn who first tried to help his father and srI vibhIshaNAzhwAn who first tried to help his brother - but eventually both of them gave up their relationship and surrendered to bhagavAn to protect themselves, we should also try to help others, but when our position itself is challenged, we should simply give up the attachments and take shelter of bhagavAn. In the last pAsuram, AzhwAr says, one who follows this principle of avoiding unnecessary association, can live happily even in this samsAram (which is full of sorrows) by fully engaging in kainkaryam. Even after being favourable towards bhagavAn and bhAgavathas, giving up attachments towards others, developing great taste to enjoy bhagavAn's divine auspicious qualities, AzhwAr is wondering why he is not getting engaged by bhagavAn in kainkaryam. AzhwAr understands that bhagavAn is always waiting to engage everyone in his kainkaryam (because he is equal to all) and realizes that he needs to perform kainkarya prArthanai (revealing his desire for engaging in kainkaryam), he does that at the lotus feet of thiruvEnkatamudaiyAn. We can see nammAzhwAr also prayed for un-interrupted, pure kainkaryam at the lotus feet of thiruvEnkatamudaiyAn in ozhivil kAlamellAm (thiruvAimozhi 3.3) padhigam. In this padhigam, AzhwAr desires to be something in thiruvEnkatam hill. He desires to be a fish in the pond, a tree, a bird, etc., and finally says that it does not matter what it is, he wants to be something there. 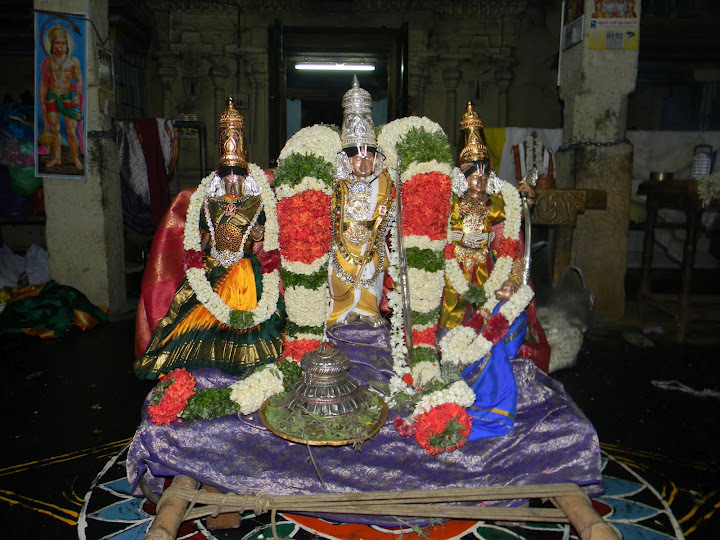 ananthAzhwAn explains that AzhwAr would even not mind being thiruvEnkatamudaiyAn himself. bhattar explains AzhwAr saying that "neither I need to know I am there, nor thiruvEnkatamudiyAn needs to know that I am there - I just have to be there". Also, AzhwAr reveals the most confidential principle of our sampradhAyam which is achithvath pArathanthriyam (showing utter dependency on lord like insentient) - we should be like achith (insentient) in being completely controlled by bhagavAn but we should also show some joy in being controlled by bhagavAn to prove that we are chith (sentient/knowledgable). In the last pAsuram, AzhwAr says that, one who understands this padhigam will become completely dependent on thiruvEnkatamudaiyAn. thirumanthram explains ananyArha sEshathvam (total servitude to bhagavAn alone and no one else). ahankAram and mamakAram. ahankAram means anAnthmani Athma budhdhi (considering body, mind, etc as AthmA/Self) and mamakAram means asvE sva budhdhi (considering some one else's property as our own). These two are the root cause for one's binding in the samsAram according to sAsthram. This is common for all jIvAthmAs, what to speak about great emperors (who have more opportunity for such ahankAram and mamakAram) due to their high position. Unless the jIvAthmA becomes completely accessible to bhagavAn, there is no true realisation. Even when one becomes fully surrendered, if there is a tinge of ahankAram and mamakAram, the true realisation will not manifest. According to sAsthram, it is said that srIman nArAyaNan is the master of the entire creation and once we are surrendered to him, we should not look out for any other refuge. 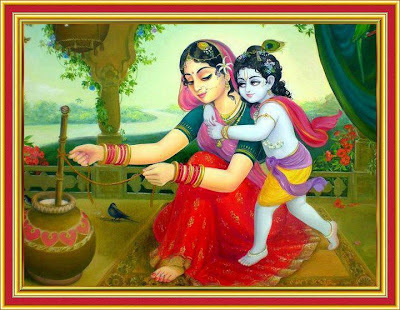 And being surrendered to him means being surrendered to his devotees as well. AzhwAr being situated at this level, thinks about why he still has not achieved emperumAn and realises that he is yet to show that srIman nArAyaNan is the only refuge for him. In this padhigam, AzhwAr establishes that only thiruviththuvakkOttamA is his master and controller and neither he is dependent on himself, nor he is dependent on any one else. When a mother gets angry with a child, since the child is fully dependent on the mother and no one else, the child still goes to the mother only. The same way, even if we become target of emperumAn's anger due to our sins, we should only depend on him. When a doctor is even cutting/applying great heat to cure a disease, the patient understands that the doctor is doing it for the ultimate benefit of the patient and co-operates. The same way, whatever emperumAn gives us, we should accept that with gratitude. In the last pAsuram, AzhwAr declares that, the ones who understand these 10 pAsurams, will not reach narakam - here narakam means samsAram, since for prapannas being in samsAram is like being in narakam only. After glorifying archAvathAra emperumAns, AzhwAr desires to enjoy vibhavAvathArams. 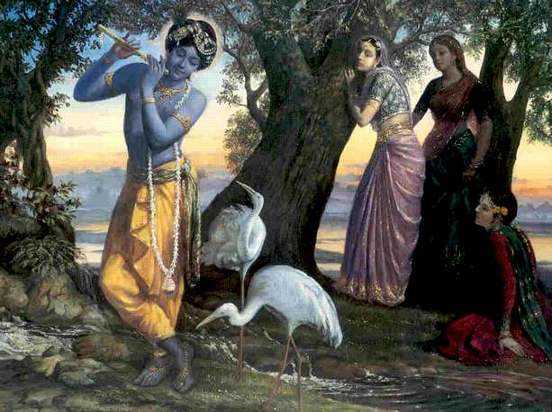 Of those, krishNAvathAram being the most recent, AzhwAr assumes the mood of gOpis who enjoyed wonderful pastimes with krishNan. Having full knowledge about the relationship between him and bhagavAn, she assumes the mood of a pirAtti (srI mahAlakshmi) and starts having sweet quarrels with emperumAn. nammAzhwAr manifested his firm nature while assuming the form of gOpis in minnidai madavAr (thiruvAimozhi 6.2) padhigam. thirumangai AzhwAr manifested his most tender nature while assuming the form of a gOpi. Here kulasEkara AzhwAr manifests his princely qualities (being born in a kshathriya family) while assuming the form of gOpis. krishNAvathAram is the most recent incarnation of srIman nArAyaNan. That is why many AzhwArs sung many pAsurams in relationship with kaNNan emperumAn. As AzhwAr has the same love of the many gOpis put together towards emperumAn, he starts manifesting divine pastimes with emperumAn. In the last pAsuram, AzhwAr declares that the one who repeats these pAsurams (even without having the same mood as AzhwAr himself), they will have no sorrows in this life and after. For prapannas, separation from emperumAn is sorrow. After understanding that AzhwAr has the eternal relationship with bhagavAn which even allows him to have sweet quarrels with him, he feels for having lost having such relationship thus far. Reflecting on that, AzhwAr assumes the mood of dhEvaki pirAtti who gave birth to kaNNan emperumAn but missed out on the whole of childhood activities. In this padhigam, AzhwAr beautifully brings out kaNNan emperumAn's childhood pastimes. He glorifies yasOdhai's great divinity and being so fortunate to fully witness the navanItha chouryam (butter theft), etc of kaNNan emperumAn. AzhwArs fully become immersed when they think about kaNNan emperumAn's childhood activities due to him being the most supreme still making himself fully controllable by the gOpis and gOpas of vrindhAvan. AzhwAr finally glorifies dhEvaki also since she was fortunate to carry emperumAn and give birth to him and finally witness his divine childhood pastimes later (after kamsa's death) by the divine grace of emperumAn. In the last pAsuram, AzhwAr declares that the ones who can sing these pAsurams with tune will enjoy emperumAn in paramapadham where there is unlimited bliss. AzhwAr thinks about how kausalyA had the fortune of taking care of her dear son, srI rAman. AzhwAr looking at thirukkaNNapuram sauri perumAL, shares the same feeling of kausalyA and brings out the glories of sauri perumAL. AzhwAr sings 10 pAsurams which brings out the great motherly affection of kausalyA in the form of singing soft lullaby to induce srI rAman to sleep. srI rAman's vIryam (bravery) and supremacy over all dhEvathas are beautifully presented in these pAsurams by AzhwAr. AzhwAr's great attachment to srI rAman can be wonderfully understood through these pAsurams. In the last pAsuram, AzhwAr declares that the ones who understand these pAsurams, will become very matured and developed in their bhakthi. This maturity is nothing but showing vAthsalyam (motherly affection) towards emperumAn. 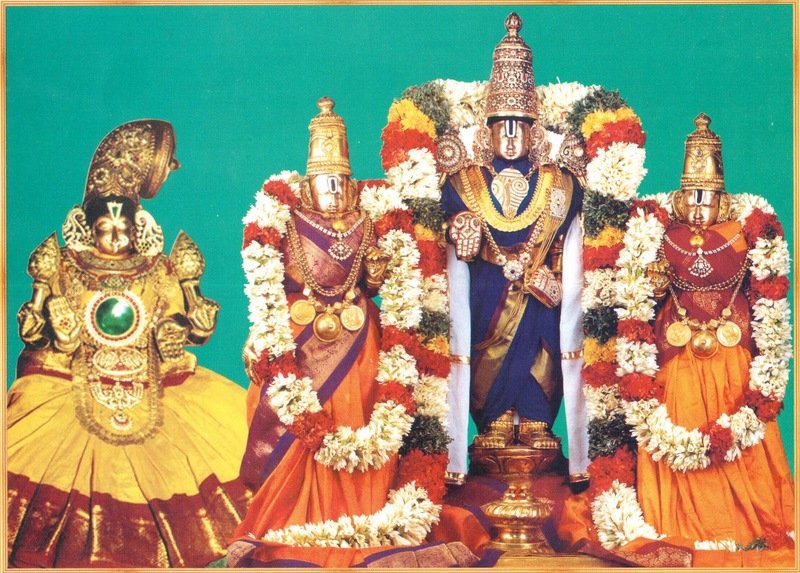 This is the most advanced stage of bhakthi - i.e., mangaLAsAsanam (constantly praying for bhagavAn's well being) - periyAzhwAr and emperumAnAr were situated in this mood always and is specifically glorified by piLLai lOkAchAryar in his srIvachana bhUshaNam and maNavALa mAmunigaL in his upadhEsa rathina mAlai. AzhwAr enjoyed kausalyA's great fortune previously. In this padhigam, AzhwAr assumes the mood of dhasarathan who enjoyed srI rAman's childhood activities but when srI rAman grew up, dhasarathan lost the opportunity to have bhagavath anubhavam since he sent srI rAman on kaikEyi's request to vanavAsam (forest dwelling) for 14 years. 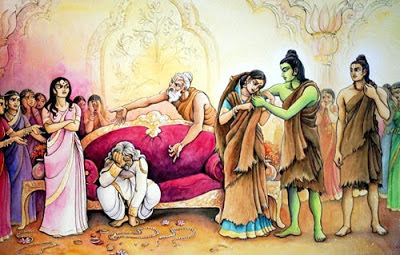 AzhwAr, assuming the mood of dhasarathan cries out due to great sorrow that srI rAman being the most tender prince (along with equally tender sIthA pirAtti and iLaya perumAL (lakshmaNan) had to go and suffer in the forest. He desires to have srI rAman as his son, birth after birth. AzhwAr also highlights the beauty and graceful appearance of srI rAman in this padhigam. In the last pAsuram, AzhwAr declares that the ones who understand these 10 pAsurams will engage in bhagavath vishayam not engage in inappropriate actions. In this context, we can also understand that, srIvaishnavas who understand the importance of bhagavath vaibhavam, when posed with a challenge of chosing between visEsha dharmam (bhagavath kainkaryam - special principles) and sAmAnya dharmam (karmAnushtAnam, etc - ordinary principles), they will give more importance to bhagavath kainkaryam. Dhasarathan chose to follow sAmAnya dharmam (fulfilling the vow to his wife) over visEsha dharmam (protecting emperumAn) and ended up losing emperumAn fully. emperumAn descends to dhivyadhEsams in archA vigraham (form) with great love towards his devotees. One such dhivya dhEsam is thillai thiruchithrakUdam where emperumAn is in the form gOvindharAjan. Just like srI vAlmiki bhagavAn sung srI rAmAyaNam in glorification of srI rAman, AzhwAr beautifully sings the whole charithram of srI rAmAyaNam in just 10 pAsurams and relates his anubhavam to gOvindharAjan emperumAn as if emperumAn is enacting the charithram visually in front of AzhwAr at present. In the 10th pAsuram, AzhwAr beautifully explains that gOvindharAjan emperumAn is manifesting all the qualities of parampadhanAthan fully here and ofcourse more since sausIlyam (magnanimity), saulabhyam (easy accessibility), etc have no real manifestation in paramapadham (since everyone in paramapadham is fully realised and have no defects). In the last pAsuram, AzhwAr declares that the ones who understand these pAsurams, will ascend to paramapadham and enjoy the unlimited divine auspicious qualities of emperumAn in paramapadham. Thus we have seen a little glimpse of this wonderful perumAL thirumozhi, where kulasEkara AzhwAr brings out the wonderful aspects of sharaNAgathi - engaging in favourable activities towards bhagavAn/bhAgavathas, avoiding unfavourable activities, having great faith in emperumAn, accepting him as our protector, offering oneself to bhagavAn fully and showing great humility. 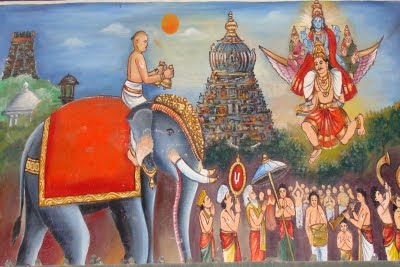 kulasEkara AzhwAr's archAvathara anubhavam can be viewed at http://ponnadi.blogspot.in/2012/10/archavathara-anubhavam-kulasekara.html. In the previous article (http://ponnadi.blogspot.in/2013/02/dhivya-prabhandha-pramanya-samarthanam-1.html) we saw the first part of this beautiful section in 6000 padi guru paramparA prabhAvam. Now we will see the continuation of that section. Through the above pAsurams, we can understand that AzhwArs (all pAsurams happens to be from nammAzhwAr) have stated that he is also given his body by bhagavAn, he is also given a place in bhagavAn's sarIram, he also worships srIman nArAyaNan, he is also not qualified to glorify bhagavAn, etc - i.e., the qualities that were explained for other dhEvathas are not unique to them and are common for all jIvAthmAs. dhEvathas (brahmA, rudhran, etc) are given their position based on their karmam. AzhwArs were personally hand-picked from samsAram by emperumAn out of his desire to reform many jIvAthmAs. 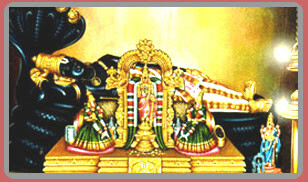 dhEvathas reside in bhagavAn's form during praLayam for protection. AzhwArs are glorified as "NIkkamillAvadiyAr" (நீக்கமில்லாவடியார்) - those who are never separated from bhagavAn. dhEvathas are called servitors of bhagavAn only because they glorify him when sathva guNam (mode of goodness) arises in them. AzhwArs are fully situated in sudhdha sathvam (pure goodness) and are constantly engaged in kainkaryam without any break. 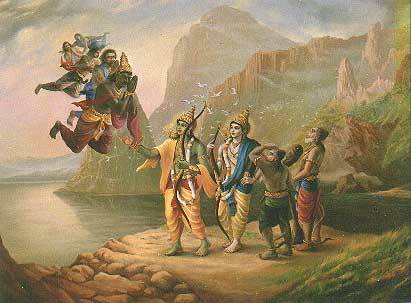 When dhEvathas become affected with rajO/thamO guNam they sometimes ask "Who is that vishNu?" and at times even fight with bhagavaN like it happened during bANAsura charithram where rudhran fought against krishna bhagavAn. Thinking about all of these, thirumazhisai AzhwAr sung "pidhirum manamilEn pinYchagan thannOdu ethirvan avan enakku NErAn" where he himself says he is greater than rudhran because he is constantly thinking about srIman nArAyaNan. Thus, we can understand that AzhwArs are far greater than other dhEvathas. But, How can we understand that dhivya prabhandhams to be equivalent to samskritha vEdham (which is nithyam - eternal, apuarushEyam - not compiled by any one and nirdhOsham - no defects). dhivya prabhandhams are in thamizh language (instead of the dhEva bhAshai samskritham) and that are sung (some) AzhwArs who are not born in brAmaNa varNam. It can be compared easily - let us see how. If the dhivya prabhandhams were sung by brAhamaNa AzhwArs only, only brAhmaNas will be able to understand that and attain salvation and the others may not be able to relate to that and benefit. Also, since prapathi is sarvAdhikAram (any one can perform prapathi) and dhivya prabandhams fully focus on prapathi, emperumAn facilitated AzhwArs to be born in different varNams for the upliftment of samsAris who are immersed in this ocean of samsAram. mathsya purANam - harikIrththim viNaivANyath brAhmanNENa NarOththama; bhAshAgANam Na gAthavyam thasmAth pApam thvayA krutham (ஹரிகீர்த்திம் விநைவாந்யத் ப்ராஹ்மணேந நரோத்தம; பாஷாகாநம் ந காதவ்யம் தஸ்மாத் பாபம் த்வயா க்ருதம்) - Oh best of men! Except while glorifying lord vishNu, poems/songs in other languages cannot be uttered; But since you punished the ones who were glorifying Lord vishNu (in other languages) you have acquired sins for that. Since, nammAzhwAr said "vadamozhi maRai" (வடமொழி மறை) in thiruvAimozhi 8.9.7 - northern language (samkritha) vEdham, it is clear that there is southern language (dhrAvida) vEdham (which is thiruvAimozhi and other 3 prabhandhams of nammAzhwAr). Since nammAzhwAr says "poyyil pAdal" (பொய்யில் பாடல்) in thiruvAimozhi 4.3.11 which means his pAsurams are fully truth and not mixed with any lies. apaurushEyathvam (not created by any one) is one of the unique qualities of vEdham. When something is created by some one it will be bound by the limitations of the creator. Even if bhagavAn himself creates some scripture, some one could say it will have his own personal influence (which is actually good). But since vEdham is not created by any one (including bhagavAn), it has free from all defects (nirdhOsham). Here it is established that AzhwArs dhivya prabhandhams are also free from all defects. As nammAzhwAr himself says in thiruvAimozhi - 10.7.5 - "yAnAyththannaith thAn pAdith thennAvennum ammAn" (யானாய்த்தன்னைத் தான் பாடித் தென்னாவென்னும் அம்மான்) - srIman nArAyaNan sung on himself through the mouth of nammAzhwAr and gets blissful. Since bhagavAn is called sthava priya (in vishNu sahasranAmam), he likes to be glorified and he glorifies himself through AzhwArs. As thirumangai AzhwAr says in periya thirumozhi - 5.7.3 - "annamAy anRanGku arumaRai payaNdhAn" (அன்னமாய் அன்றங்கு அருமறை பயந்தான்) - bhagavAn appears as a divine swan and reveals the vEdham to brahmA and as bhagavAn appears as vyAsar (shakthi AvEsha avathAram) and explains the vEdham in detail, he reveals the dhrAvida vEdham through AzhwArs. Thus it is explained that dhivya prabhandham is also apaurushEyam and defectless. As per suptha prabhudhdha (ஸுப்த ப்ரபுத்த) nyAyam, when a teacher teaches to his students every day after awakening the students from sleep - their teaching is considered as continuous, bhagavAn periodically wakes up jIvAthmAs through AzhwArs with the eternal dhivya prabhandham. Just like bhagavAn preserves vEdham in his heart during praLayam and reveals them it brahmA, etc., dhivya prabhandhams are also revealed in every chatur yugam through AzhwArs. Thus dhivya prabhandhams also are as valid as vEdham itself with respect to apuarushEyathvam, nithyathvam and nirdhOshathvam. Now, Let us see that dhivya prabhandhams are in fact much greater than samskritha vEdham. In bhagavath gIthai, kaNNan emperumAn declares that "thraigunNya vishayA vEdhA:" (த்ரைகுண்ய விஷயா வேதா:) meaning samskritha vEdham is meant for people of all modes (sathvam, rajas and thamas). But dhivya prabhandhams are presented by AzhwArs who were divinely blessed with blemishless knowledge by bhagavAn himself for the whole purpose of uplifting jIvAthmAs from this samsAram and leading them in to the path of emancipation through prapathi (surrender). So, it is fully meant for people who want to be fully situated sudhdha sathvam (pure goodness). Thus dhivya prabhandhams are far greater than samskritha vEdham. The learned people state that "analysing archAvathAra emperumAn based on the raw material (metal, wood, stone, etc) and the qualities of a vaishnava based on his birth are considered as doubting the chastity of ones own mother (which is very cruel)". (mAmunigaL beautifully explains this in his vyAkyAnam as follows. Thus it is fully established that dhivya prabhandhams are most glories and are the most valid pramANams for us to accept and follow. Did AzhwArs see emperumAn in prathyaksham (directly) or in mAnasa/jnAna sAkshAthkAram? It is jnAna sAkshAthkAram only and not direct vision. But sometimes we see AzhwArs saying in thiruvAimozhi 1.9.9"kamalak kanNnNan en kanNnNinuLLAn kAnNban" (கமலக் கண்ணன் என் கண்ணினுள்ளான் காண்பன்) - puNdarikAkshan is within my eyes and I am seeing him, thiruvAimozhi 5.5.1 "Nambiyai NAn kanNdapin" (நம்பியை நான் கண்டபின்) - After seeing thirukkuRungudi nambi, etc. Those are all jnAna sAkshAthkAram (vision in mind) which is equivalent to direct vision. In many pAsurams AzhwArs crave for a direct vision of emperumAn. In thiruvAimozhi 4.7.10 nammAzhwAr says "pakkam NOkki NinRalaNdhEn pAviyEn kAnNginRilEn" (பக்கம் நோக்கி நின்றலந்தேன் பாவியேன் காண்கின்றிலேன்) - I was looking for your arrival and being very unfortunate, unable to see you. He shows great desire to see emperumAn directly. In thiruvAimozhi 4.7.4 "kAnNa vaNdhu en kanN mugappE" (காண வந்து என் கண் முகப்பே) pAsuram he says that even brahmA, rudhran, etc cannot directly see emperumAn and him desiring to have that dharshan is not reasonable. But in the next pAsuram "appanE adalAzhiyAnE" (அப்பனே அடலாழியானே) itself he cries out "Because of your glorious generosity and since you are capable of removing any hurdles, please present your beautiful form in front of me". Finally in 4.7.10 he first says "kAnNginRilEn" (காண்கின்றிலேன்) saying he still does not see emperumAn directly and finishes the pAsuram saying "thakka jnYAnak kanNgaLAlE kanNdu thazhuvuvanE" (தக்க ஜ்ஞானக் கண்களாலே கண்டு தழுவுவனே) - I will see him with my inner eyes and embrace him. Thus we can understand that AzhwArs saw emperumAn through their inner eyes and not external eyes. This is what is explained by azhagiya maNavALa perumAL nAyanAr in AchArya hrudhayam chUrNikai 230 "kanNdEn enRa paththum utkanNnNAlE" (கண்டேன் என்ற பத்தும் உட்கண்ணாலே) meaning 10 places where AzhwAr identifies that he saw emperumAn relates to mAnasa sAkshAthkAram (inner vision only). 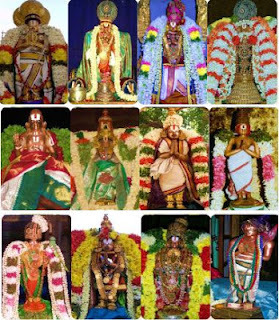 (mAmunigaL in his vyAkyAnam, most beautifully brings out the 10 places where AzhwAr says he saw emperumAn). This is the principle of sudhdha sampradhAyam as taught by our pUrvAchAryas. nammAzhwAr, thirumangai AzhwAr, mudhalAzhwArs, etc., identified in their pAsurams that they saw emperumAn only through their inner eyes. Now, archAvathAra emperumAns is the only place where prathyaksha dharshanam (direct vision) is possible. Thus, the ones who are fully faithful towards AzhwArs (who are most glorious, who are the leaders of prapanna kulam, who appeared for the upliftment of everyone and who blessed us with their dhrAvida vEdham which can be easily understood by everyone) are called jIvan mukthars (Note: this is to highlight the glories of srIvaishnavas as it is explained by AzhwArs themselves as nilath thEvar/bhUsurar - sUris of this world - this is not the same jIvan mukthar concept of advaitham). 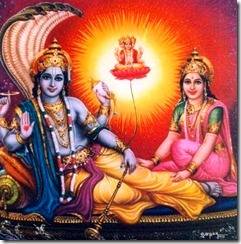 Those srIvaishNavas who have given up any interest in heretical doctrines and materialistic aspirations, who are so fixed in sAsthram that they do not give up their AchAram/anushtAnam even when their life is under threat, being subservient to bhagavAn vishNu instead of their own senses, always contemplating on the true knowledge about the jIvAthmA, giving up violence fully and being situated in full control over their senses, being merciful towards all living beings, giving up all attachment towards lust and wealth, being full realised, being content, having good control over the prasAdham (food) they consume, not being coward and at the same time not being angry, not having mamakAram towards wife and children, etc are considered to be jIvan mukthars as nammAzhwAr said in thiruvAimozhi 5.5.11 "aRiyakkaRRuvallAr AzhkadalnYAlaththuLLE vaittanNavar" (அறியக்கற்றுவல்லார் ஆழ்கடல்ஞாலத்துள்ளே வைட்டணவர்) - the one who knows the core principles of thiruvAimozhi and lives by that are great vaishNavas in this world itself. Thus, AzhwArs, out of their mercy, blessed us these dhivya prabhandhams for the upliftment of everyone in this world and then ascended to paramapadham. Thus ends this beautiful section named dhivya prabhandha prAmANya samarthanam in 6000 padi guru paramparA prabhAvam. The publisher of 6000 padi guru paramparA prabhAvam identifies that this section is not consistently found in the various original manuscripts and concludes that this section might have been added by later day AchAryas to firmly establish the truth in some of these matters. Let us proceed with the article now. While dhivya prabhandhams of AzhwArs who appeared as thathva dharsis (one who fully understands the truth) are considered as the most important pramANam (valid source of knowledge), they present various aspects of srIman nArAyaNan and dhEvathAntharams (other dhEvathas). 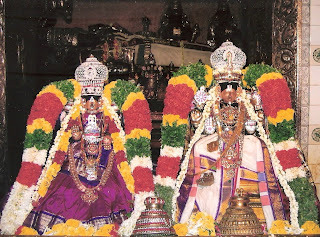 In many pAsurams, is established by AzhwArs that bhagavAn, just like giving his chest as the residing place for srI mahAlakshmi who is hailed as vishNOsrIranapAyinI" (One who is the wealth of vishNu and who never separates from him), who is eternally most auspicious and is the main consort of bhagavAn, he gives place to brahmA, rudhran, etc who are situated in the mode of rajas (passon) and thamas (ignorance). thiruvAimozhi - 1.3.9 - valaththanan thiripurameriththavan idam peRaththuNthith thalaththezhu thichaimugan (வலத்தனன் திரிபுரமெரித்தவன் இடம் பெறத்துந்தித் தலத்தெழு திசைமுகன்) - srIman nArAyaNan has rudhran (the one who destroyed the 3 towns) on his right side, in his naval he has brahmA who has 4 heads (one head per direction). thiruvAimozhi - 2.2.3 - ERanaip pUvanaip pUmagaL thannai, vERinRi vinN thozhath thannuL vaiththu (ஏறனைப் பூவனைப் பூமகள் தன்னை, வேறின்றி விண் தொழத் தன்னுள் வைத்து) - One who keeps rudran (rishaba vAhanan), brahmA (one who is on a flower) and srImahA lakshmi (who residing in a flower) and is most worshippable by everyone because of this. In many pAsurams, it is established by AzhwArs that brahmA, rudhran, etc approach bhagavAn, offer their obeisances and glorify him. thiruvAimozhi - 2.2.10 - kaLvA emmaiyum Ezhulagum NinnuLLE thORRiya, veLLERan NAnumugan iNdhiran vAnavar puLLUrthi kazhal panNiNthu Eththuvar (கள்வா எம்மையும் ஏழுலகும் நின்னுள்ளே தோற்றிய, வெள்ளேறன் நானுமுகன் இந்திரன் வானவர் புள்ளூர்தி கழல் பணிந்து ஏத்துவர்) - rudhran, brahmA, indhra and the dhEvas worship the lotus feet of srIman nArAyaNan (the garuda vAhanan) and glorify him as "Oh thief! you are the one who created me and all the 7 worlds from you". thiruvAimozhi - 10.10.3 - mEvith thozhum biraman chivan iNdhiran (மேவித் தொழும் பிரமன் சிவன் இந்திரன்) - brahmA, rudhran, indhra who fully worships srIman nArAyaNan. irandAm thiruvanthAdhi - 12 - avar ivar enRillai aravanNaiyAn pAdham, evar vanNanGki EththAdhAr enNnNil, pavarum chezhunGkadhirOn onNmalarOn kanNnNudhalOn anRE? thozhuNthagaiyAr NALum thodarNdhu (அவர் இவர் என்றில்லை அரவணையான் பாதம், எவர் வணங்கி ஏத்தாதார் எண்ணில், பவரும் செழுங்கதிரோன் ஒண்மலரோன் கண்ணுதலோன் அன்றே? தொழுந்தகையார் நாளும் தொடர்ந்து) - If we enquire who are all the worshippers of the lotus feet of the sEsha sAyi srIman nArAyaNan, the most popular dhEvathas like Adhithyan, brahmA, rudhran worships him and glorifies him every day. thiruvAimozhi - 3.1.7 - kEzhththa chIr aran mudhalAk kiLar dheyvamAyk kiLarNdhu chUzhththamarar thudhiththAl un tholpugazh mAchUnNAdhE (கேழ்த்த சீர் அரன் முதலாக் கிளர் தெய்வமாய்க் கிளர்ந்து சூழ்த்தமரர் துதித்தால் உன் தொல்புகழ் மாசூணாதே) - if brahmA, rudhran, etc (who are well knowledgable) with their capable words, glorify you, that will only minimize your natural greatness. thiruvAimozhi - 1.5.2 - NinaiNdhu NaiNdhu uLkaraiNdhu urugi imaiyOr palarum munivarum punaiNdha kanNnNi NIr chANdham pugaiyOdu ENdhi vanNanGkinAl ... un perumai mAchUnNAdhO? mAyOnE! (நினைந்து நைந்து உள்கரைந்து உருகி இமையோர் பலரும் முனிவரும் புனைந்த கண்ணி நீர் சாந்தம் புகையோடு ஏந்தி வணங்கினால் ... உன் பெருமை மாசூணாதோ? மாயோனே!) - Even if dhEvas starting with brahmA, rudhran, etc and sanakAdhi munis meditate upon you, complete melt upon thinking your glories, worship you with flowers, water, etc., considering your glories, their worship can never be a match. 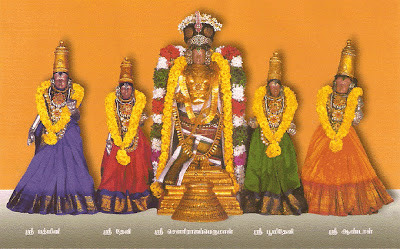 thiruvAimozhi - 3.1.10 - piRaiyERu chadaiyAnum NAnmuganum iNdhiranum iRaiyAdhal aRiNdhEththa vIRRiruththal idhu viyappE? (பிறையேறு சடையானும் நான்முகனும் இந்திரனும் இறையாதல் அறிந்தேத்த வீற்றிருத்தல் இது வியப்பே?) - Since rudhran who has a crescent in his matted hair, brahmA, indhran are created by srIman nArAyaNan himself, even if they understand emperumAn's supremacy and glorify him, that will not add any new glories to him (since their knowledge is limited and bhagavAn's glories are unlimited). But you accept their glories out of your kindness since they have taken shelter of you. thiruvAimozhi - 3.5.8 - NaLirmadhich chadaiyan engO? NAnmugak kadavuL engO? (நளிர்மதிச் சடையன் என்கோ? நான்முகக் கடவுள் என்கோ?) - Can I say you are the one with the cool crescent on the matted hair (rudhran)? Can I say you are the one who is the father of rudhran (brahmA)? 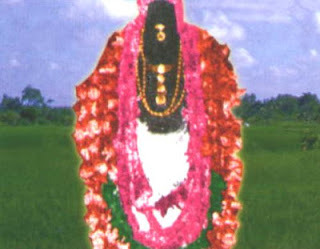 thiruvAimozhi 6.9.1 - chivanAy ayanAnAy (சிவனாய் அயனானாய்) - You became shivan and brahmA. thiruvAimozhi - 7.6.7 - en thirumArban thannai, en malaimagaL kURan thannai, enRum en NAmagaLai agampAl konNda NAnmuganai (என் திருமார்பன் தன்னை, என் மலைமகள் கூறன் தன்னை, என்றும் என் நாமகளை அகம்பால் கொண்ட நான்முகனை) - One how has srI mahAlakshmi in his chest, One who has pArvathi as his better half (of the body) and one who is the husband of saraswathi. thiruvAimozhi - 10.10.1 - muniyE NAnmuganE mukkanNnNappA (முனியே நான்முகனே முக்கண்ணப்பா) - Oh the one who is constantly meditating for the upliftment of jIvAthmAs! Oh the four faced brahmA! Oh the 3 eyed rudhrA! Thus AzhwArs have presented many different ideas about srIman nArAyaNan in relation to other dhEvathas right from the beginning, in the middle and in the end. Can we trust such dhivya prabhandhams as the most important pramANam for us? Yes. We can trust their words. Let us see how. AzhwArs right upfront establish their vairAgyam (detachment) towards other dhEvathas in many pAsurams. thiruvAsiriyam - 6 - OO! ulaginadhu iyalvE! InROL irukka manNai NIrAtti, padaiththidaNdhu unNdumizhNdhaLaNdhu thErNdhu ulagaLikkum muthaRperum kadavuL NiRpa, pudaip pala thAn aRi dheyvam pEnNudhal, thanAdhu pullaRivu AnNmai poruNdhak kAtti (ஓஓ! உலகினது இயல்வே! ஈன்றோள் இருக்க மணை நீராட்டி, படைத்திடந்து உண்டுமிழ்ந்தளந்து தேர்ந்து உலகளிக்கும் முதற்பெரும் கடவுள் நிற்ப, புடைப் பல தான் அறி தெய்வம் பேணுதல், தனாது புல்லறிவு ஆண்மை பொருந்தக் காட்டி) - The nature of this samsAram (material world) is very pathetic. When ones own mother is present, ignoring her, the less intelligent people will be decorating and worshipping a wooden-plank. The same way, when srIman nArAyaNan who first created the universe, rescued it from the ocean, protected the universe by keeping it in his stomach safely, etc., is present, the less intelligent people reveal their lack of intelligence by worshipping/glorifiying other dhEvathas who themselves were created..
thiruvAsiriyam - 7 - em perumA mAyanai allathu orumA dheyvam maRRudaiyamO yAmE (எம் பெருமா மாயனை அல்லது ஒருமா தெய்வம் மற்றுடையமோ யாமே) - Do I have any other dheivam other than the great srIman nArAyaNan). nAnumugan thiruvanthAdhi - 84 - pidhirum manamilEn pinYchagan thannOdu ethirvan avan enakku NErAn (பிதிரும் மனமிலேன் பிஞ்சகன் தன்னோடு எதிர்வன் அவன் எனக்கு நேரான்) - I am firmly confident that rudhran who sings emperumAn's glories (when his sathva guNam arises) is not an equal to me since I am constantly situated in sathva guNam. periya thirumozhi - 8.10.3 - maRRumOr dheyvam uLadhenRu iruppArOdu uRRilEn (மற்றுமோர் தெய்வம் உளதென்று இருப்பாரோடு உற்றிலேன்) - I will not associate with the ones who accept other dhEvathas. thiruvAimozhi - 1.1.7 - uLan chudarmigu churuthiyuL (உளன் சுடர்மிகு சுருதியுள்) - shining brightly in vEdham which is both nithyam (eternal) and apaurushEyam (authorless/defectless). 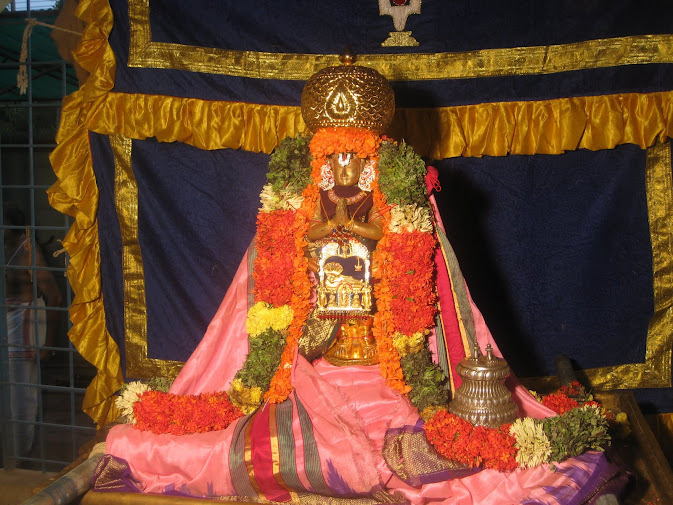 thiruvAimozhi - 2.8.6 - thIrththan ulagaLaNdha chEvadimEl pUNthAmam chErththi avaiyE chivan mudimEl thAn kanNdu pArththan theLiNdhozhiNdha paiNthuzhAyAn perumai pErththum oruvarAl pEchak kidaNdhadhE? (தீர்த்தன் உலகளந்த சேவடிமேல் பூந்தாமம் சேர்த்தி அவையே சிவன் முடிமேல் தான் கண்டு பார்த்தன் தெளிந்தொழிந்த பைந்துழாயான் பெருமை பேர்த்தும் ஒருவரால் பேசக் கிடந்ததே?) - When arjunan wanted to blessed by shiva with some weapons in the battle field, he asks krishNan what to do. krishNan simply asks him to worship his most pure and auspicious lotus feet (that measured the universe) with some flowers and in the night shivan appears in arjunan's dream and shows him carrying those same flowers in his head and blessed him the weapons. Thus it is shown that srIman nArAyaNan's supremacy is well established. srIman nArAyaNan (puNdarikAkshan - the lotus eyed) is the supreme god who is seen in the vEdham and in the entire universe. periyAzhwAr also established that srIman nArAyaNan's supremacy in the king's court in front of many great scholars and got the reward from the madhurai king. He established that using verses from vEdham and great sages. If janArdhanan who is greatest amongst everyone and who is known as purusha gets pleased with anyone, he achieves the eternal spiritual planet. I am confidently declaring this. There never was some one equal to NArAyaNan, there never is and there never will be. I can accomplish everything using these most truthful words. Thus based on the above pramANams, we can see that, AzhwArs are fully following what is said in vEdham and are never bound to the any defects. We can also understand that they would not display any inconsistency in their words. The reason why we see the various pAsurams on the relationship between srIman nArAyaNan and other dhEvathas is due to the nature and activities of these other dhEvathas. Let us see that now. It is heard that brahmA who was born from the lotus flower of srI mahAvishNu worships vishNu for 1000 crore yugams and again becomes the main progenitor and heads the material creation. shiva who is a mahAthmA offers himself in the sarvamEdha yAgam and becomes the lord of lords. since their svarUpam, sustenance, action and inaction are fully dependent on bhagavAn as the sarIram (body) fully depends on the jIvAthma/sarIri (soul). Achyuthan is the only master/controller of the whole creation and is fully capable. brahmA, shiva, etc have certain powers/capabilities (which are a miniscule fraction of bhagavAn) and are bhagavAn's amsams (forms). Thus, we can conclude that AzhwArs' dhivya prabhandhams are the most important pramANams based on the above explanations. The created beings are also him (his own forms); The creators like brahmA, etc are also him; He is the one who sustains the universe; He is the one who swallows the universe; He is the one who is being sustained. vishNu, the one who has everything as his body is the most supreme; the one who can benedict; the one who is fit enough to be worshipped. 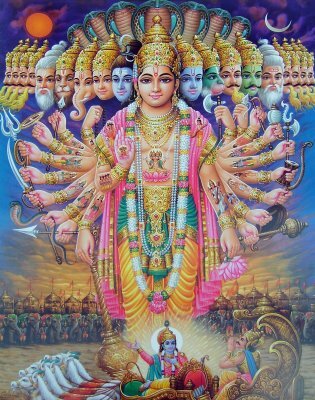 I surrender unto janArdhanan/vishNu who is the primordial being who takes the form of rudhran at the end of the kalpam (during praLayam) and destroys everything. janArdhanan (srIman nArAyaNan) gets the names brahmA, vishNu, shiva while performing the duties of creation, sustenance and destruction respectively. shiva, brahma who are various forms of dhAmOdharan (one who was bound by yasOdhai on his waist). When bhagavAn is paramAthmA and these other dhEvathas are his sarIram (body), sometimes they themselves are directly indicated as him because when something is mentioned about the body it leads up to the soul (its actually intertwined). When a person says "I am fat, I am thin" himself and others say "You have become fat, You have lost weight" - I and You refers to the AthmA (soul) and fat and thin refers to the body. Similarly, if these dhEvathas are explained/glorified some times it goes all the way to the paramAthmA (super soul) who controls these dhEvathas. AzhwArs present bhagavAn as chEthanams (sentients) and achEthanams (insentients) in many pAsurams. mudhal thiruvanthAdhi - 15 - mudhalAvAr mUvarE; ammUvaruLLum mudhalAvAn mUri NIr vanNnNan (முதலாவார் மூவரே; அம்மூவருள்ளும் முதலாவான் மூரி நீர் வண்ணன்) - brahmA, vishNu, shiva are the main deities; of those 3, srIman nArAyaNan - the one who looks like a beautiful cloud (both for the color and the generosity) is the controller of the other two. Supreme god is the one who has all sentients as his body and all insentients as his body. AzhwArs also establish srIman nArAyaNan's parathvam (supremacy) and sarva antharyAmithvam (him being the super soul of everyone/everything) based on his showing of vishwarUpam for arjunan in the kurukshEthra battle field. rudhran's words - ka represents brahmA; I am the master of the ones who are focussed on their bodies. We are born from you - so you are called kEsava (the master/controller of brahmA and Isa). puNdarikAkshan (krishNan) touched parIkshith's head to foot with his lotus feet that was worshipped by brahmA and rudhran. Thus, we can see that sruthi, smruthi, ithihAsa, purANas establish that all the dhEvathas are subservient to srIman nArAyaNan, they worship him and their everything depend on his will. srI mahAlakshmi never separates from srIman nArAyaNan who is the most supreme; she is his dear consort, his power potency and has the same qualities like him. It is shown in the sAsthram that these other dhEvathas also exist on bhagavAn's divine form. Do they reside on his form always like srI mahAlakshmi as explained in the previous slOkam? NALum en pugazhgO una chIlamE? நாளும் என் புகழ்கோ உன சீலமே? How can I glorify your magnanimity? 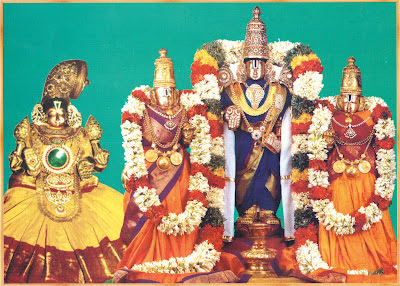 You are presenting yourselves to brahmA (who is in the lotus flower and has taken up your naval as his residence), rudhran (who holds an axe and has taken up your right side as his residence), nithya sUris who contantly serve you and dhEvas who are always looking some material benediction from you. Even if I constantly glorify you, I will not be satisfied. The most auspicious one who is filled with good qualities due to him allowing rudhran to stand next to him in thirukkurungudi. This principle of bhagavAn giving his form as the residence for other dhEvathas is explained using an example. bhattar explains to NanjIyar that "During kalahams (floods or disturbance from invaders), every one (irrespective of their nature) will come and stay inside the adayavaLaindhAn layer/fort in srIrangam. Once normality returns, every one will return to their residences outside, but even in their absence, the place where they resided will be identified as their past residence. Similarly, even though bhagavAn gives his body as the residence for these dhEvathas at times, even when they are not there, that place is identified as the residence place of those dhEvathas". So far, we have seen that AzhwArs presented the core principles of vEdham/vEdhAntham, i.e., srIman nArAyaNan is the supreme god and all other dhEvathas are subservient to him. In the next article we will see how the specific glories of AzhwArs and their dhivya prabhandhams.